Adirondacks have to offer, it is also a place to explore and learn about the deep history of the town’s beginnings, its evolution and eventual decline as a major center of industry in the region, and its status today as a small but vibrant part of Warren County. From the people who first settled here when the region was still considered “a dark and dangerous place,” to its establishment as a town in 1813 and the growth of the lumber, tanning and hospitality industries, to its current reputation as a destination for lovers of all things “Adirondacks,” Warrensburg has so much to offer its members, visitors and friends. The Warrensburgh Historical Society was founded in 1973 to provide historical information to our residents and visitors to the community. The Museum, as well as our many educational and community-oriented programs are designed to enhance your knowledge of and appreciation for Warrensburg and the surrounding region. 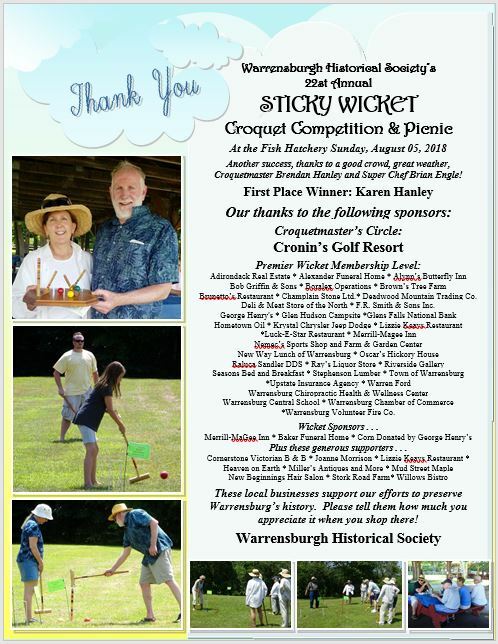 Our annual events, The Sticky Wicket and the Graveyard Walks, have become staples in the community and are just two examples of the unique array of activities we bring to the community. Our hope is that you will leave our Museum and our events with a deeper understanding of and respect for the history of the Town of Warren. The mission of Warrensburgh Historical Society is to discover and preserve the rich artifacts we have gathered from long-time residents of the town and other sources, and to disseminate, educate and illuminate the history and hardships, the successes and failures, the high points and hard times Warrensburg has experienced since it was first settled in the early 19th century up to the present day. ​"The guide makes all of the difference in the world. Bob showed me around the place with confidence in the history, and clarity of the past. The museum is also set up very simply and aesthetically pleasing to the eye. For kids, there's an interactive play area in the middle of the museum. I would recommend this for anyone." Founded in 1973, the Warrensburgh Historical Society is incorporated under the Laws of the State of New York. It holds a permanent charter, granted by the Board of Regents, Education Department of the State of New York, granted on October 28, 1977. The purpose of the Warrensburgh Historical Society and Warrensburgh Museum of Local History is to preserve our rich history for future generations. We accomplish that, thanks to the support and sponsorship of our members. If you would like to become a member, we invite you to visit our Member page for more information and to learn about the many benefits of membership.